Are you searching for free dog house plans? Check out what we've found for you, plus a few tips to help your project turn out right. If you plan it right and you're careful with your supply purchases, building your own dog house can be a relatively inexpensive adventure resulting in a really nice shelter for your pet. Have you ever built any kind of structure from plans before? If not, then it's a good idea to visit some of the free classes offered at many building supply warehouses. It doesn't really matter whether or not the class is specifically about building a dog house. Even a class on building a shed will give you a working idea of the tools needed and how to work with similar construction materials. You can take some of the knowledge you've gathered and apply it when the time comes to build your canine palace. Once you have a feel for basic construction, it's time to look for plans. 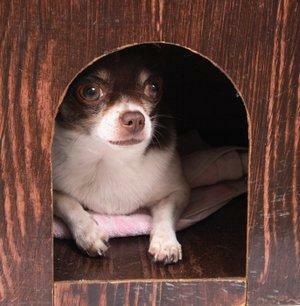 If you're hoping to keep expenses low, then free dog house plans are good for the budget. As you search for free dog house plans, keep in mind that fancier models are not necessarily better than simpler designs. A utilitarian dog house might actually be more efficient at protecting your dog from the elements. Designs that involve higher ceilings and wasted space require more of your dog's own body heat to be depleted before the temperature inside the dwelling begins to warm. If you must go with a more stylish look, add a façade above the original roof so the construction plays no role in the functionality of the design. There are plenty of good, free dog house floor plans available if you know where to look. It may be easiest to obtain dog house plans from the same building supply warehouse that offers free classes or your local hardware store. These stores have a vested interest in offering free plans; mainly because they expect you'll buy your tools and construction supplies from them. In fact, you may find that the plans are tailored to the exact brands the store sells. While there's nothing wrong with this, it can affect the total cost of building the dog house. Remember, you're still free to comparison shop at other construction outlets even if the plan is free. However, there is something to be said for the level of customer service you'll receive from an employee who is familiar with the plan and can help you find the exact materials you need. Weigh the difference for yourself and make your purchases accordingly. If you can't find free plans locally, you can take your search to the Internet where free dog house floor plans are plentiful. Here are some samples of what you'll find. Lowe's offers a simple plan design for first-time builders. You'll find an itemized supply list as well as step-by-step instructions and plenty of visual aids to help keep your project on track. Build Eazy offers a moderately easy dog house plan for our friends who use the metric system, along with primers on which type of lumber to use as well as how to properly paint your finished creation. Free Woodworking Plans offers six free dog house floor plans, including plans for a very simple A-frame dog house design. All About Dog Houses has to be the destination for do-it-yourself types searching for a wide variety of free plans. You'll find plans for basic models like Sparky 1 with a removable roof for cleaning, to a more detailed Gingerbread Dog House suited for those with intermediate carpentry skills. The site offers no less than 18 free dog house floor plans of varying size and detail, so it's well worth your time to do some serious browsing at the All About Dog Houses website.